"TLIB is the fastest and most flexible version-control system on the market." 9-Dec-2001: This has nothing to do with TLIB, but as a service to our friends and customers Dave Burton has compiled some "virus avoidance advice" to help you avoid getting burned by Magistr, Nimba, Badtrans, Sircam, Goner, etc.. You can read it here: virus_advice.txt. 29-Jun-2001: TLIB 5.53c is released. Fixes an installation problem which occurred when installing TLIB under Windows 2000 with a user ID in the "power user" group. We lost a telephone voicemail mailbox a couple of days ago; if you called us and left a message, and we did not return your call, please accept our apology, and please call again. 30-May-2001: TLIB 5.53b is released. Fixes a few minor bugs; see the Release Notes file, release.txt. 2-May-2001: TLIB 5.53 is released! New features include: Improved support for sharing files between projects; A new command to reclassify source file(s) from private to shared (or vice-versa); A new scan-for-included-files option when opening Borland Delphi project files; A new, extended wildcard syntax to tell TLIB to find not just a named C, C++, or Pascal source file, but also whatever include files it references; The new tlmerge utility, which is a 32-bit version of our venerable DIFF3 merge tool; Numerous GUI usability improvements, such as an enhanced version history list that is displayed when you double-click a file name, which lets you immediately select, extract, inspect, and compare old versions; Better right mouse button support, including the ability to edit MRU (most recently used) drop-down lists by right-clicking in them; Visual Compare improvements, such as the ability to drag the vertical divider right and left, to resize the two panes; and many other improvements. For more details, including a list of recent bug fixes, see the Release Notes file, release.txt. For upgrade pricing, click here. Your upgrade is free* if you purchased TLIB Version Control Combo Edition less than one year ago. 27-Mar-2001: We're having email trouble again. If you have difficulty sending us email please resend it to: burton@netmar.com. Thank you for understanding! 14-Feb-2001: TLIB 5.52 is released! (This is version 5.52f; versions 5.52a-5.52e were beta versions.) New features include a runlength-compressed & CRC-checked binary storage format; an an EOF-tolerant (ctrl-Z ignoring) ASCII storage format; automatic save & restore of column and window sizes in the 32-bit GUI; Visual Compare improvements, including customizable colors; jour2snp, a tool to build after-the-fact snapshots from the TLIB journal file; Migrate command improvements; display of current and project-level version numbers when listing versions; native project support for MicroEdge Visual SlickEdit project and workspace files, and more. 21-Nov-2000: TLIB 5.51i is released. 27-Oct-2000: TLIB 5.51h is released. It adds support for Inprise/Borland C++ Builder 5.0 .bpr project files. Also adds support for Microsoft Developer Studio .dsw Workspace Files, (which really just group multiple projects). Also made several of other minor improvements. 13-Oct-2000: JourJoin, in our downloads area, is a little program to "join" (combine) the comment records in a TLIB journal file, so that there is only one comment field in the journal file for each U (Update) or N (New library) command. When you store a new version of a source file in a TLIB library, TLIB optionally records your action in a chronological Journal File, in CSV (comma-separated values) format. (This is useful for generating customized reports, as well as providing a chronological "audit trail" of version control activity.) You can configure what types of information you want recorded in the journal file, but most users let TLIB store the full version comments. When the version comments exceed one line, TLIB writes multiple records to the journal file, to record the additional comment lines. However, if you would prefer a journal file format in which all the comments are combined into one big field, in one record, you can use the JourJoin utility. This is useful when importing the TLIB journal file into some kinds of databases, such as recent versions of Microsoft Access. 27-Aug-2000: TLIB 5.51g is released. 16-Sep-1999: Hurricane Floyd missed us (mostly). We did experience a brief power hit, but we're up and running today. Thank you for your patience! 15-Sep-1999: We've had sporadic problems with our email system at burtonsys.com. If your email to someone@burtonsys.com fails, please try it again, or else try sending it to burtonsys@bigfoot.com, or to burton@netmar.com. Or call us at 1-919-481-6658 or 1-919-481-0149. Also, please forward any "bounce" messages to us! Thank you for understanding! 12-Aug-1999: TLIB 5.51a is released! The GUI and command-line Win32 versions of TLIB are finally out of beta. Other new features include "FileType Auto" (automatic handling of binary vs. text files), a beta Visual Basic 6.0 Add-In, and improvements to the installation process. 7-Jul-1999: We've just recovered from a mail server crash disaster at Burton Systems Software. We lost a lot of pending emails (and perhaps a fax or two). If you sent us email (or a fax) but did not get a reply, please accept our apologies, and please resend it. 25-Feb-1999: TLIB 5.50w, now with long file name support under NT, rather than just Win-95/98! Supports quoted file names and file names containing blanks, too. 17-Feb-1999: TLIB 5.50v, added a SourceSafe-to-TLIB conversion utility for customers who are switching from Microsoft or OneTree/Icarus SourceSafe to TLIB Version Control. We also improved several of the other conversion utilities, especially the Intersolv/Merant/Sage/Polytron PVCS-to-TLIB converter. We now have tools to automate conversion from: PVCS, SourceSafe, RCS (both MKS and GNU/Unix variants), MS Delta, and Sourcer's Apprentice. See Features. 17-Dec-98: TLIB 5.50s, added native project file support for Premia Codewright Editor .PJT files. To view the full TLIB 5.53 Release Notes file, release.txt, including a list of recent bug fixes, click here. For upgrade pricing, click here. Your upgrade is free* if you purchased TLIB Version Control Combo Edition less than one year ago! For Y2K Compliance Statement, click here. For over 10 years, TLIBTM Version Control has been one of the leading configuration management tools for the PC software development community. TLIB Version Control is distinguished by superb performance, extensive configurability, and powerful multilevel project support. 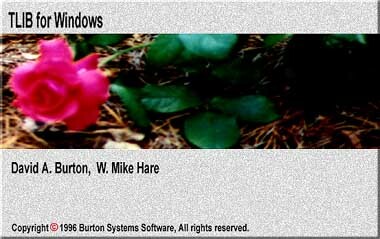 Now, with the introduction of TLIB Version Control for Windows 5.53, Burton Systems Software brings new power, convenience, and ease of use to version control on the PC platform. Then you need TLIBTM Version Control for Windows! File-oriented ("normal") mode. Lets you use wild-cards and/or file-lists to specify files to be managed by TLIB. Compiler-native project mode. Lets you "open" your compiler's or editor's native project file in TLIB, avoiding the need to use wild-card specifications or file-lists. Just click the "Mode" button to switch between compiler-native project mode and normal (file-oriented) mode. Invisible DDE mode. This mode is used by add-in modules that interface to TLIB for Windows from within other products. TLIB's "invisible DDE" interface is one of the public APIs that we provide, to help you integrate your product with TLIB. We also support a lower-level call-interface API directly to the TLIB DLL engine, bypassing the GUI front end. The TLIB for Windows built-in Visual Compare can be used to show the differences between two disk files or between two versions of a single file. It is also available at the click of a button while you enter the comments for a new version, during an Update (check-in), to show the differences between the new version and its predecessor, regardless of whether you are running TLIB for Windows directly or via a TLIB Add-In. Unlike most compare programs, TLIB shows you what has changed within the lines, as well as identifying which lines have changed. TLIBTM Version Control is the version control program of choice for many businesses and programmers! Read the accolades from the trade press about TLIB Version Control. We've got lots of 'em! Old ones. New ones. And we just keep making it better. TLIB Version Control is very affordable. Click here for a detailed price listing, which also includes upgrade prices. Do you keep HTML files under version control? The last-modified dates and version numbers on these Web pages are updated automatically by TLIB Version Control, through the use of TLIB's highly-flexible keyword feature. TLIB's keyword support lets you specify the format in which the keyword information is inserted, so there's no "$Revision:" garbage displayed along with the inserted version number on your Web page. What if your version control system can't do that? Fortunately, TLIB supports automated conversion from PVCS, MS Delta, Sorcerer's Apprentice, several variants of RCS, and SourceSafe. You may leave the subject line blank; it is ignored. Note: We've had some problems with our email recently, so if your email to us bounces, or you get no reply, please resend it to the alternate email address, above. Also, we'd be grateful if you would forward the bounce messages to us. Thank you for your patience! Copyright © 1997-2001, Burton Systems Software.